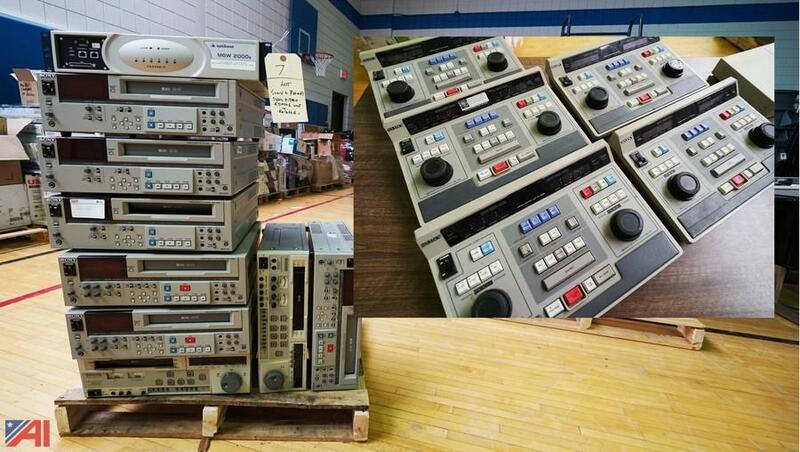 The auctioneer did not inspect the cases for completeness regarding remotes, power cords etc. These units were in working condition when removed from service. The new Mitsubishi ultra-portable, is powerful, versatile, bright and compact, and packed with the most innovative performance enhancing features available. 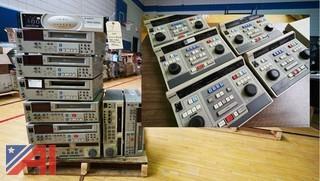 These units were in operational condition when removed from service (although untested). These units are untested with functional condition unknown. All the features of the ZR40, plus Progressive Photo Mode for exceptionally sharp still images, Multi Media Card and Secure Digital (SD)Memory Card technology for easy storage and transfer of still images, and a USB terminal. Outstanding optical performance and strict attention to detail makes the ZR45MC an indispensable memory maker. Your style and creativity are limited only by your own imagination. The flexibility and quality of the ZR45MC will win you over. Also, several boxes of accessories with some cables, chargers, batteries, power supplies, several palm pilots, 2) HP compact pocket PC'S etc. All were in working condition when removed from service, battery conditions are unknown. MiniDV Cassette Tapes Keeps Your Memories Alive With Outstanding Picture Quality, Thanks to Linear Technology. First Mini Digital Video Cassette Tape With a Vapor Disposition Structure for High Quality Digital Reproduction. Records Up To 60 minutes in SP Mode or 90 minutes in LP Mode. Carbon Coated, for Added Durability. Packed with a host of advanced features and fully backed by Sony's vast experience and commitment to VCR manufacturing, the SVP-5600 brings highly sophisticated S-VHS editing and extreme ease-of-use to the edit suite. Provides Frame Accurate editing, RS-422 Interface, built-in TBC, User-Friendly menu and SMPTE LTC/VITC Time Code operation. For added flexibility, optional Component output allows easy integration into Betacam SP-based systems. With its advanced features and outstanding cost performance, the SVP-5600 complements any professional editing environment - from basic Cuts-Only editing to a sophisticated A/B Roll edit suite. Combining a host of advanced features and outstanding value, the SVO5800 is a powerful tool that will complement any professional editing environment, from a basic two-machine editing system to a sophisticated A/B roll editing suite. This professional S-VHS editing recorder/player is the result of Sony's accumulated experience and commitment to the development of editing recorders. The SVO5800 model offers all the convenient operating features required for professional editing in the S-VHS format: frame accurate assemble/insert editing, built-in time base corrector, built-in LTC/VITC time code generator/reader and user-friendly menu operation. An RS-422A interface port is also provided for versatile editing system expansion and flexible system control. The optional Component Out capability allows easy integration into Betacam SP-based editing systems. Panasonic AG-DS555 S-VHS Hi-Fi Editing Recorder, is a Sleek editing VCR and Player offering high-grade editing functions and smooth, and easy operation. It features First DVCPRO VTR to record/playback in both standard DV and Mini-DV and it plays back Mini and standard DVCAM tapes. Built-in Digital TBC eliminates even small amounts of jitter, skew, head impact error, and color blurring. Whether you are a pro, or just want to look like one, this Videonics professional title maker is for you. It delivers sharp, high-resolution titles with outlines and borders on top of colored backgrounds or superimposed on live video. Features over 200 types of styles and size combinations; over one million colors, shadows, bold and outline styles; 24 special effects; standard computer keyboard with special characters; stores over 16,000 characters; and multidirectional eight-speed scroll and crawl. Made in USA. Two VTR, Time Code or CTL Editing Controller. Features both 33-pin parallel and 9-pin control port. Selectable pre-roll times; (3/5/7/10 seconds); edit recall; GO-TO; self diagnostics are standard. •When a 9-pin equipped VTR is connected, the RM-450 not only allows the CTL based editing but also makes Time Code based editing possible. •The RM-450 accepts REF.VIDEO IN (reference video input) for synchronized operation. •The RM-450 detects differences between the pinch on delay times of the player and the recorder and stores them in the memory using LEARN function. •Allows the audio edit in-point to be set differently from the video edit in-point. •The RM-450 can use the Assemble and insert (V/A1/A2) edit modes, and provides editing functions such as editing. •The RM-450 has a built-in self-diagnostic function to improve serviceability and make maintenance easy. •The RM-450 provides JOG/SHUTTLE dials on both the player side and recorder side and the function keys are laid out for easy operation to meet user demands. These units were in working condition when removed from service and are sold as is. Cutting Edge Technology and Design: Advance tape formula such as the super-rigid Anchor Effect Interaction (AEI) Binder, helps maintain the tapes ultra-low dropout rate even after repeated use. Multi-carbon black-coating effectively reduces jitter to achieve superb broadcast quality images. A tough shock-resistant shell produced long-term outstanding performance. • High Energy Reproduction with Certified Reliability: Maxell’s Black Magnetite magnetic particles provide 15% greater magnetic energy than gamma ferric oxide particles and our unique Multi-Orientation Technology further improves the tapes C/N ratio. Specialized certification systems ensure reliability, delivering a dependable high energy, high S/N ratio tape that resists output degradation even after multiple playbacks. • Superior Performance Inside and Outside the Studio: ST-126 / SE-180 BQ employs the unique Smooth Winding Reel (U.S.P. 4,932,604; EU Patent 0 136 504) to smoothly pack tape when editing and achieving, as well as in demanding ENG/EFP situations. No box sleeves used for bulk duplicating. Superior flexibility, reliability and convenience. Offers the convenience of LaserDisc dual-side access without having to turn the disc over. This Level I/Level III player is ideal for multimedia applications and classroom presentations. A touch of the button on the remote control or front panel continues disc play quickly and smoothly to the other side of a LaserDisc. Additionally, the CLD-V5000 disc tray accepts audio and video CD's to ensure simplified CD loading and smooth one-touch play. Disc Turn Time 12 sec. Stop Time (LD) Less than 7 sec. This ram inventory is used and not in its original packaging and was in working condition when removed from service. Items are new/like new and in working condition. They appear to be in good condition. Items are new/used and in working condition. 03A, C4149A, 38A, 96A, Q2613A, 61X, C4151A, 49X, 00A, 92A, 15A, etc. This is all unused stock. An affordable USB MIDI controller keyboard for getting started with music on your computer. The M-Audio Keystation 49e USB MIDI Controller Keyboard has class-compliancy with OS X and Windows XP for true plug-and-play operation. The included Maximum Audio Tools software bundle is designed to get you playing immediately. 49-note full-size, velocity-sensitive keyboard; built-in MIDI interface; pitch and modulation wheels; and sustain pedal input. Sleek, compact, and USB bus-powered. The M-Audio Keystation 49e is compatible with most educational and studio software. Keyboards are in new condition with their original boxes. This unit is used, untested and the functional condition is unknown. Page last refreshed Thu, Apr 25, 2:26pm ET.